From 18 January to 24 February 2018 MARIEVIC presents solo exhibition Uniclones at Stems Gallery in Brussels. Uniclones offers a witty commentary on the contrast between agrarian fabric production and the clothing this fabric is used to produce, as well as a provocation on the roles of corporation and consumer in maintaining corporate mechanisms. 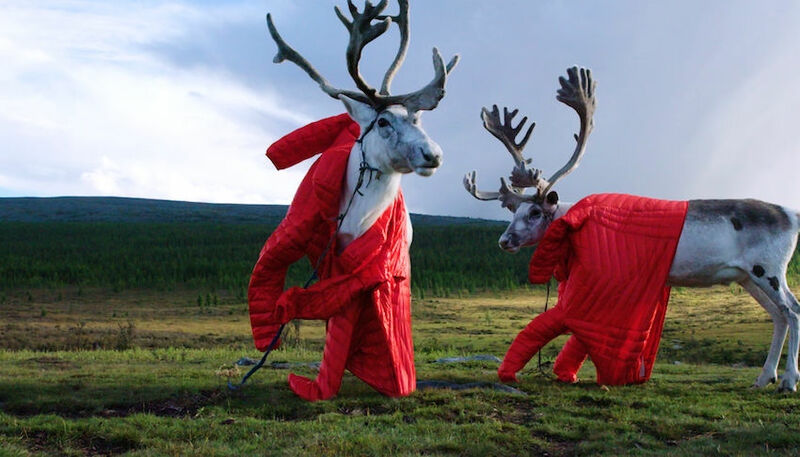 The exhibition features a two-channel video installation showing binary views of goats, camels, deer, yaks and sheep in their natural habitat, wearing Uniqlo products. Open pastures are juxtaposed with polished products; the colours of grass and mountains contrast with bright dyes. Uniclones takes a close look at agrarian dynamics, at the relationship between individual and flock. This dynamic is mirrored in the marketplace, where companies shepherd consumers toward products and consumers maintain demand. As a global brand, Uniqlo has made accessible to the masses a luxury good that was once only available to the few. Their products are attractive and disposable; at the same time their production process seeks to be ethical. The retailer provides its community of consumers an individuating product: it satisfies the hedonist desire of quality conscious consumers while neutralizing (via corporate social responsibility) the anxiety provoked by its own mechanisms of production, appeasing a sort of ethical dilemma within the herd. In this dynamic, the corporation has become the shepherd and the consumer, the flock. The Uniclones project won the Lishui International Photography Festival alongside Tan Qiu-min’s project Harmony. The theme of the festival, which took place in November 2017, was The Image of the Era of Hypermedia; one of its highlights was a group exhibition, titled If Art Could Start Anew Again, which featured Chinese and international photographers including MarieVic. Prior to this, Uniclones was shown at Palais de Tokyo from 26 September - 4 October 2017.